Hives in children are also called urticaria, but may are often simply referred to as welts. These welts are swollen areas on the surface of the child's skin that can vary in size and location, but most of the time have well defined edges with a pale center and a reddish border. Children hives often cause itching, and can move from location to location on the child. Hives and children go hand in hand, as your child’s immune system is learning what a serious allergen is and what isn't. That's why hives in children are very commonly seen together - not just in your child but almost all children. Your child could have a small group of hives that goes away within 15 minutes or even a couple of hours, and then a few hours later reappears. It is possible for your child's hives to stick around for months, which is often referred to as chronic hives. What Causes Hives in Children? Children hives are caused by your child's immune system sensing an allergen being present in or on the child. To combat the allergen, your child’s immune system sends histamine out into the blood stream. The histamine's purpose is to remove the allergen from the body. It does so by causing raised red welts, swelling and itching. Because your child’s immune system hasn't experienced everything that an adults immune system has, they don't know yet that something as simple as heat exposure (i.e. heat hives) is not an allergen. There are many causes of hives in children including but not limited to food allergies, pollen, animal or pet fur, bug bites and stings, sun, heat, cold, fever, infections, illness, medications and even using certain soaps in the bathtub and detergents when washing your child's clothes. As an example, my daughter is terribly allergic to eggs. If she eats them, she'll throw up and spend the next couple of hours extremely nauseous. Even worse though is if she gets them on her skin, which causes her to break out in the worst hives rash I have ever seen! And not just on the spot where the egg white touched her, but all over her arms and face. What Are The Symptoms of Hives in Children? The most common symptom of hives in children are raised welts on various parts of your child's body that usually itch incredibly. Your child may not scratch them, but instead cry or throw a temper tantrum over the discomfort. While your child may not verbalize the sensations they are experiencing, hives in children are usually accompanied by an uncomfortable burning sensation at the location of the outbreak. Hives in children are also accompanied by other symptoms, depending on what triggers the hives outbreak. If your child has an infection that is causing the hives outbreak, then your child may also have a runny nose, cough, fever or a even a sore throat. Are Hives in Children Dangerous? Hives in children is often not life threatening. They are not contagious and usually pass with time and avoidance of the allergens that caused the reaction. However, if you notice facial swelling (medically referred to as angioedema), which makes it hard for your child to breath, call 911 immediately. The swelling may be cutting off their airflow which will lead to them passing out and dying if the airflow is cut completely. My daughter is deathly allergic to peanuts and had angioedema when she first tried peanut butter. We called 911 and had her rushed to the nearest hospital via ambulance. Don't take a chance with your child's life! If they're having trouble breathing, call 911 ASAP! How Do I Get Rid Of Hives in Children? 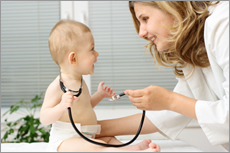 Most parents contact their pediatrician for medical advice (which I recommend). They may not know all the treatment options if they don't specialize in hives outbreaks. Most will simply suggest an over the counter antihistamine, such as Children's Benedryl. This does not cure the hives; it simply helps alleviate the allergic reaction until the hives go away on their own. I recommend a nice soothing oatmeal bath in luke warm water for taking the edge off your child's itch. My daughter loves to mush the oatmeal up in her hand, which almost completely takes her mind off the hives outbreak. NEVER give your child a hot bath as this will inflame the hives and make the itch even more. When it comes to hives and children, there are few medications that are suggested simply because of how young they are. Our treatment page offers you information on one of the highest recommended medication available: OxyHives. This medication is now available without a prescription and will not simply mask the itch and redness like antihistamines do. This over the counter medication has proven to be the hives cure that many people have searched for over the years. And I have yet to hear of somone with a child that minds taking the medication as it doesn't have the awful taste most children's medication do. OxyHives has no harmful side effects (like so many other treatments do) and you can use it as much as you need to. Remember to keep track of what causes your child's hives outbreaks: foods, medicines, sun exposure, excessive heat, etc. By tracking this you should be able to pinpoint the cause of your child's outbreaks, helping you to avoid it in the future.